Stained glass is something which is bound to capture the interest and attention of whoever lays eyes on it. Even though the tradition of placing stained glass in churches was adopted a very long time ago, it is still continued today. Even in the United States, there are countless stunning examples in church stained glass windows. However, stained glass connoisseurs need not voyage far to see these beauty of stained glass. There are many beautiful churches right here in our beloved state of Kansas that have stunning stained glass widows. Below, we’ve listed some of our favorites. Whether you’re a church that’s looking for inspiration to get ideas for your own stained glass windows or are simply someone who loves stained glass, there are many places in Kansas you can visit to see beautiful church stained glass. Here are some of our recommendations. 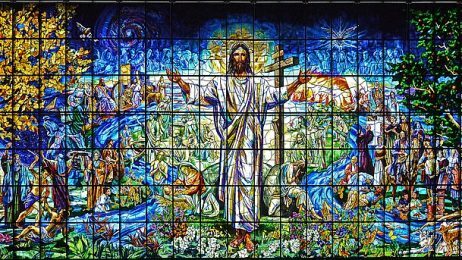 The Church of the Resurrection in Leawood has one of the largest stained glass windows in the world. The stained glass measures 93 feet by 35 feet and exhibits beautiful Biblical scenes masterfully blended together. The Country Club Christian Church in Kansas City has stunning stained glass windows that are highly intricate in their detail. The amazing colors and details of this stained glass could entertain one for hours as they gaze upon it. St. John the Baptist Catholic Church in Kansas City features stunning stained glass windows that were brought to the U.S. from Switzerland, where they were produced in a factory. Located in the Strawberry Hill area of Kansas City, this church from the 1900s is an important part of our state’s architectural history. Kansas City Stained Glass is the leading stained glass studio in Kansas. Call us today to discuss plans for a stained glass window for your Kansas church.